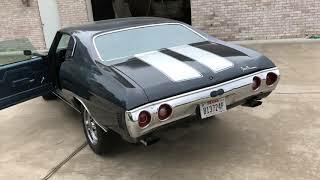 Hi, I am interested in your 1971 Chevrolet Chevelle SS listed on Autotrader for $18,000. I'd like to get more information about this vehicle and confirm its availability. Big Block 500+ cu.in. Engine with Demon carb, Moroso valve covers, headers with 3 in. Exhaust. 500+HP new build engine with less than 100 miles on it (still not broken in). 3-speed Turbo hydromatic 400 transmission with 3.07:1 ratio, 12 bolt differential (not Postitrac). Body is in very good condition, no rusted out areas. Interior is in good-very good condition with majority of interior original. Probably not a original SS model as SS badges are inconsistent but does have correct dash, gauges for SS. New Aluminum radiator with fans (not installed) will go with the car. -Garage kept and well maintained. Good restoration project in great shape.